Gosh, how did it get to be Friday, again? I meant to update earlier than this, Brownie’s honour (I was never a brownie – did they actually say that?). 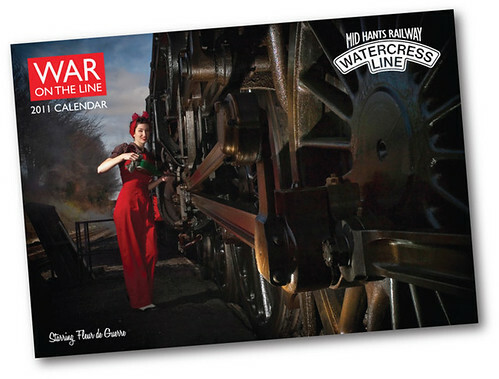 Last weekend I popped along to the Watercress Line for War on The Line, which coincided with the anniversary of D-Day; to see and sign the 2011 Calendars in which I star! It was a lovely day, very hot and muggy, but such a great event. Friendly people, some fab outfits and plenty of calendar sales! I know that quite a few readers and fans are interested in buying a calendar, so if that’s you then please do purchase one on the Watercress Line site, or click the picture below. I didn’t get to see much of the event, which was spread out over all four stations, with music, dancing, displays and more. I did get to watch a Hurricane fly over, which was spectacular. At Ropley, where I was based, there was a tempting cake stand run by some lovely ladies and gents, with all the cakes made to wartime recipes. I sampled the chocolate and beetroot brownies (seen here at the front of the table) and I was very impressed! Everyone who came to have a calendar signed was thoroughly lovely, too. Wednesday was my birthday, and I spent a perfect morning with my chap before heading off to spend the afternoon with my parents (curse the workload of a bespoke tailor!). So here’s a snap of me on a typical relaxed day – not dissimilar to the one a few posts ago. No lipstick, hair simply brushed (although I set it the day before) and repro clothing. Including my smashing new French navy trousers, a present from Shona Heyday! I have received some fabulous presents (so far… I am seeing my best friend tonight and she usually spoils me rotten – slightly embarrassingly so, even!) and I have to show them off. Pictured here are two amazing art deco teacup sets from my chap (both are lovely but the trio is outstanding and in as-new condition), and a promotional shot of the gorgeous Able Grable Lola Burns frock sent to me by Miss Matilda. My folks gave me money, so I will be treating myself to some nice new things; however my mum also bought me some tickets for us to go and see my favourite musical ever – 42nd Street. I think I last saw it on stage when I was about 10, so I am extremely excited! So my presents this year have been a real example of quality over quantity, I’m sure you’ll agree! 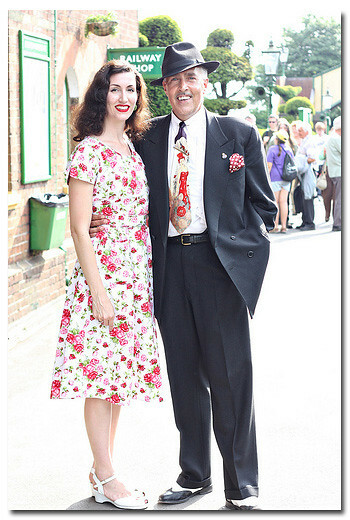 I leave you with a final picture from the War on the Line, me posing with the always darling Viv the Spiv. Now if this isn’t an advert for what good posture does for one (or rather what bad posture does), then I don’t know what is! Any girl can look slim yet fabulously curvy and pin-up perfect if she poses right, shoulder back, arm bent, tummy in and bust proud. However here I manage to look flat-chested and utterly shapeless! I still love the shot though – Viv is such a character! It’s my party this weekend, so I shall report back with more photos after I have recovered. 😉 Have a good one chapettes and chaps! HAPPY belated birthday, Fleur. Looks like you got some gorgeous goodies. As it should be!! Happy Birthday Fleur! Sounds like you had a lovely time and received some nice gifts! Congrats on the calender darling! P.S- Chocolate cake sounds yummy, I have such a sad sweet tooth! You look lovely as always, Fleur! From the photos you posted, you had a great time last weekend. Here in the states, we attended the MAAM WWII weekend, in Reading,PA and had the time of our lives! Where else can you see so many legendary warbirds? Happy birthday!! 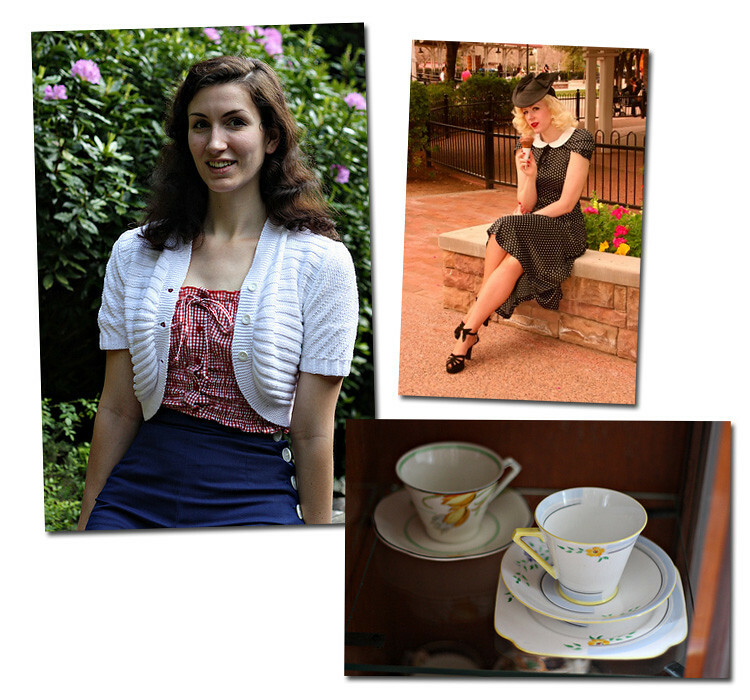 These pictures are so lovely, you suit vintage style so perfectly (obviously), I love your little white cardigan, and your floral dress in the other photo! Happy Birthday Fleur! I hope you have a wonderful party! 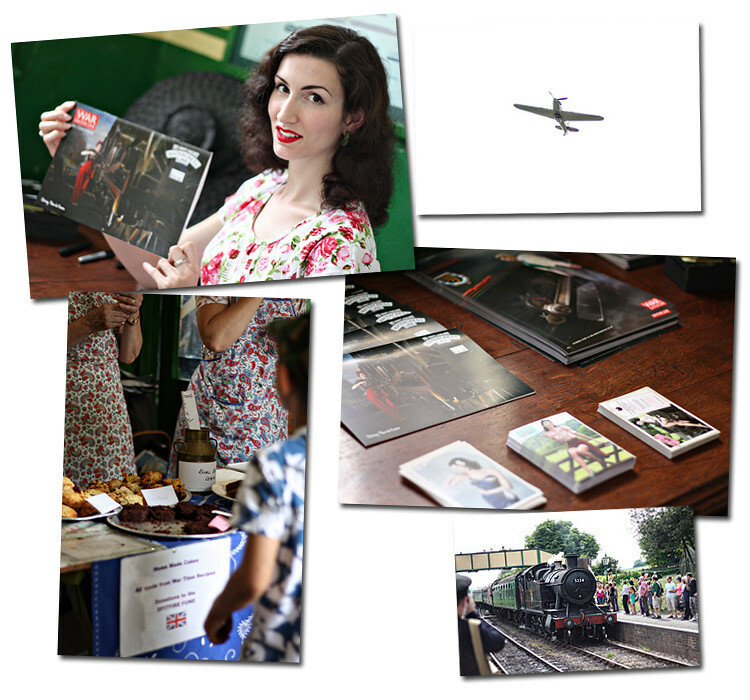 It was a top day out at the Watercress Line and it was lovey to meet you. I was your first calendar punter and my husband was the chap who offered you a biscuit and was most concerned that you should get a cup of tea! We had a great time, Viv tried to sell me nylons, got whislted at by the GI's ,the sun shone and there were some gorgeous frocks about. Perfect! You looked gorgeous, both with lipstick and without. I hope you had a wonderful birthday! Looks like you got some lovely presents. Those heyday trousers are fab i'd like to bag myself a pair. I cant seem to find them on the website though. Any idea where I can get a pair? And about the no-lipstick state… you look lovely with or without!! Wishing you the happiest and grandest of birthdays, Fleur!!! 🙂 Hope you got loads of goodies–being spoiled for one's birthday isn't a bad thing. 😉 lol. I just adore your blog. Love the calendar and the photos! So cute! Wondering if you'd be interested in a link exchange??? Would love it if you'd check out my blog and let me know what you think! I've just ordered my calendar and I Can't wait to see it!